Pictured, from left, are Stephanie McDairmant and Treasurer Kelly Mitchell. 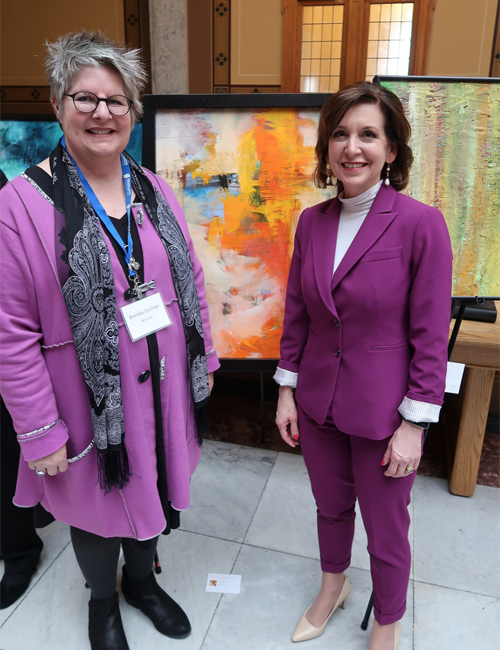 INDIANAPOLIS — On March 20, Lieutenant Governor Suzanne Crouch, Treasurer Kelly Mitchell and the Indiana Arts Commission hosted a reception to celebrate the 2019 Hoosier women artists at the Statehouse. Stephanie McDairmant, Warsaw; and Brenda Stichter, Warsaw; were two of the 39 honorees whose artwork was selected to be displayed in the offices of several Indiana political figures. 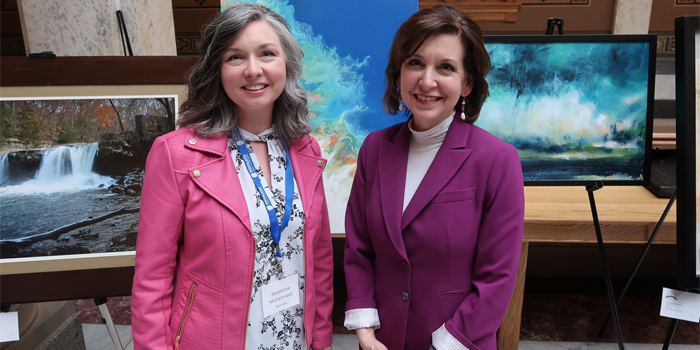 The Hoosier Women Artists competition was established in 2008 to celebrate the importance of the arts in Indiana’s communities and showcase the work of talented female artists throughout the state. The annual competition was announced in January, and 39 honorees were selected out of more than 220 entries. The entries were judged by a panel of visual Indiana arts professionals and then selected for display by Crouch and Mitchell. The 39 pieces of artwork will be displayed in the offices of Crouch, Mitchell, Secretary of State Connie Lawson, Auditor of State Tera Klutz, Chief Justice Loretta Rush and Superintendent of Public Instruction Jennifer McCormick, as well as in the office of First Lady Janet Holcomb in the governor’s residence. Pictured, from left, are Brenda Stichter and Treasurer Kelly Mitchell.